Joe L. sent this pic from his trip to Sacramento yesterday for the CARB protest. The issue at hand? 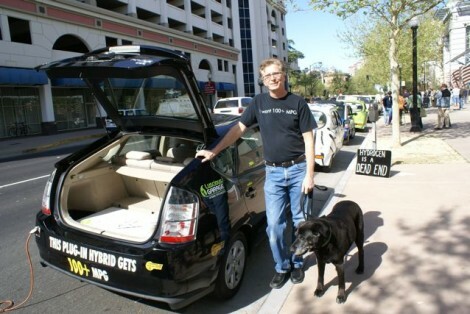 CARB’s shameless, cowardly retreat from the ZEV mandate and the public health of California. California used to be the vanguard for emissions regulation, the driving force behind improved air quality across the country. CARB’s leadership collapsed under pressure from automakers surrounding Zero Emissions Vehicles, and today’s vote on the future of the ZEV Mandate is expected to mark continued capitulation. Kudos to Plug-In America—along with the many other fantastic, clean air vehicles—for protesting the state’s missed opportunities.